Continuous batch picking of multiple orders through every pass of the warehouse. Automated batch picking and sortation system. Lightning Pick’s LP Cart mobile picking and sortation solution drives major productivity and accuracy gains for batch picking operations and other cart-based applications. 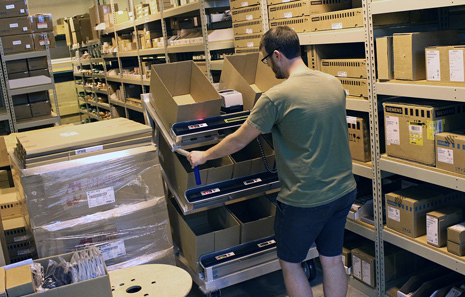 Easy to learn and use, multi-shelf carts automate batch picking for fulfillment of multiple, one- to two-line orders at the same time during a single pass through the warehouse while following the shortest route. A mounted tablet display directs pickers to the right product location. 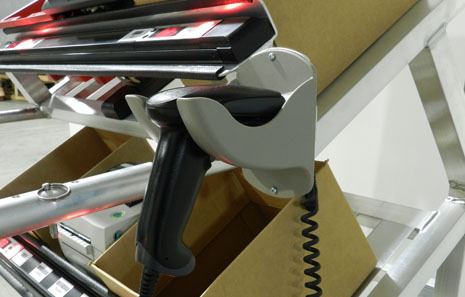 Once there, a stationary or tethered RF unit is used to scan the product bar code label. Optional product location label or other additional quality control scans are available. This illuminates lights on the cart near totes or shipping containers that require that product. Operators sort product to the correct order, in the correct quantities. Watch the video and see the LP Cart in action! Because they support batch picks of multiple orders simultaneously, mobile picking carts dramatically increase picking speed by up to 200%, while improving worker ergonomics by reducing the number of trips through the warehouse. The LP Cart is an extremely affordable way to automate picking, and for an unlimited number of SKUs. Especially for companies that can’t cost-justify implementing a full pick-to-light system at every pick face, or to run a conveyor system throughout their facility. Matthews cart technology can be retrofitted to your existing batch picking carts. Or, if you’re new to batch picking cart applications, read our new white paper to learn more. Patented Perpetual Picking Software offers the highest cart automation efficiency available. Low power consumption pick-to-light module hardware at each order bin or box position. Android tablet with color LCD screen. Radio frequency (RF) barcode scanner for item/location scanning. Long lasting battery with rechargeable mobile power pack. The system tells the pickers everything they need to know. They only have to read the instructions on the screen. These will tell them which bay to go to, which product to pick and where it goes [on the cart]. It’s designed in such a way that every time you pick up a product and put it in the box you have to scan it. If you don’t, it won’t tell you what box it should go in. Learn how our automated batch picking cart solutions can help. Lightning Pick is the largest provider of light-directed systems in North America including pick-to-light, put-to-light, pack-to-light and picking carts. The world’s top brands use LP Cart to get products into their customers’ hands, quickly and accurately.